SPOTTED in Dubai – What is this thing?! And the answer of course is, it depends!. Light surface scratching can be buffed out of acrylic. Deep scratches on the other hand are a little more difficult but we will provide suggestions about address both. Before we do though the first question to ask yourself has to be “is it worth it”? Is it worth spending time and money restoring something, particularly if it has a low replacement cost, or do you just bite the bullet and buy a new one. If the scratches cover more than say 30% to 50% of the item or if the scratching affects a large area (half a square metre or more) it wouldn’t be worth the effort. If the acrylic is very old and has UV damage (signs of yellowing and/or crazing) it certainly will not be viable. On the other hand, if it is a valuable item, a keepsake or something which is no longer available and it may be worth having a go. And of course these days many bathroom products like baths and hand basins are made from acrylic so these methods may be worthwhile trying in those situations. • You will need some 800 and 1200 grit wet and dry paper, and some metal polish (Brasso works well). • Fold the 800 grit and using water rub in a circular motion until most of the noticeable scratches become hard to see. Keep enough moisture on the paper so that a slight slurry forms. • Move onto the 1200 grit and apply the same way with water until there is absolutely no sign of any scratches. • Once satisfied that all scratches have been removed wipe dry with a clean soft cloth. The area that you have buffed may now seem duller that the surrounding acrylic so the metal polish (Brasso for example) can now be applied with a soft dry cloth to bring back the shine. It may take a few applications and a fair amount of rubbing. Work in a circular motion. Persistence and patience will pay off. • Deeper scratches can be buffed out the same way as above but you may need to start with 600 grit before moving on to 1200 grit and metal polish. If the scratch is particularly deep, say .5mm or more it probably isn’t worth it. A simple test is to run your finger over the scratch and if your nail really catches in the groove it may be too big to buff out. 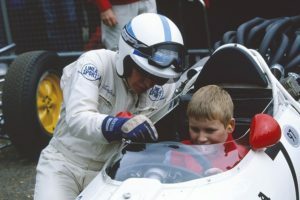 John Surtees, who has died at the age of 83, will be remembered quite simply as one of the true greats of motor racing history. The epitaph by which he will be most widely remembered, of course, is his unique achievement: the only man to win premier-class world championships on both two and four wheels. 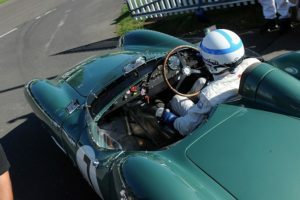 His sole F1 title was clinched in a thrilling final-race showdown in 1964, when he became the fifth driver in history, and the second Brit after Mike Hawthorn, to claim an F1 world championship for Ferrari. But it was on motorcycles – his first and always true racing love – that the Surtees legend began. In the second half of the 1950s he established himself as the world benchmark on two wheels, and at times was almost unbeatable. Seven world titles, three in the 350cc class and four on 500s, came thick and fast. Frustrated by Norton’s lack of investment and ambition, he switched to MV Agusta for 1956 and the relationship bore fruit immediately as he claimed his first 500cc crown. It was also the start of a life-long love affair with Italy, where he will forever be remembered as Il Grande John – ‘Big John’ Surtees. Born into a bike-mad family on February 11 1934, a teenage Surtees made his first motor sporting appearance in a sidecar beside his father, before the dad-and-lad duo took British motorcycling by storm in the early 1950s. 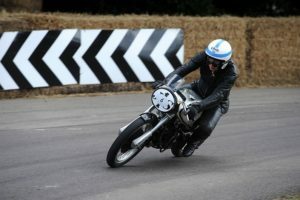 By ’55 he was considered worthy of Norton factory machinery before he made the headstrong decision to quit the biggest name in the British business and take a chance on MV with an instinctive, gut-feel decision that would become a career trademark later in life – for better, but more often for worse. His motorcycling career statistics are astonishing. Between 1951 and ’60 Surtees claimed 250 race wins from 352 starts. Along with that first 500cc title in 1956, he would secure a hat trick of class doubles: six world titles in three years from ’58 to ’60 – and his fame spread beyond motor racing. In 1959, Surtees won the BBC Sports Personality of the Year and remains the only motorcyclist to have claimed the accolade. The idea of switching to four wheels had already been put to him, but John was initially skeptical. He was a motorcyclist through and through, and had no interest in cars. But by 1960 the lure had more appeal. MV’s insistence that he could only ride the Italian bikes left him with too little racing and too many weekends free. But the agreement with Count Agusta didn’t stretch to four wheels… “The first car race I ever saw was the one I was in!” he would often recall in later years, with that trademark wide smile. 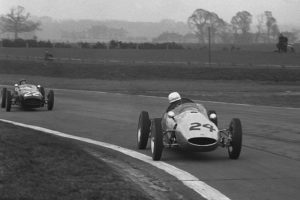 Surtees found himself pitted against Jim Clark in a Formula Junior race at Goodwood, only for a rookie error to cost him a chance of victory. Lotus boss Colin Chapman took note and snapped him up to race in F1 – a rise beyond comprehension for drivers in the modern era. And Surtees was competitive from the start. Armed with Chapman’s Lotus 18, he finished second at the British Grand Prix – his second world championship start! – and led the Portuguese GP convincingly later in the year at Oporto, until the road circuit’s tramlines caught him out. 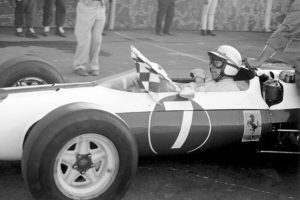 The year ended on a sour note, when he was caught up in a row with Chapman and Innes Ireland, Lotus’s first grand prix winner, over the honour of driving beside Clark in ’61. Typically, Surtees walked even though it was Ireland who had been sacked. He couldn’t have known he’d already driven the most competitive car of his F1 career and the world unknowingly lost the chance to see two of the period’s great racers go head to head. A year in a Yeoman Credit Cooper and a 1962 season in a Bowmaker Lola, both teams managed by Reg Parnell, allowed Surtees to continue to showcase his potential, even if the ultimate results didn’t follow. Ferrari had already come calling, but Surtees had judged he wasn’t yet ready for the red cars so early in his career. Enzo warned he wouldn’t ask again – but did exactly that at the end of a difficult season in ’62. John moved to Maranello for his fourth season on four wheels, with his first F1 world championship win coming in style at the Nurburgring in the summer. 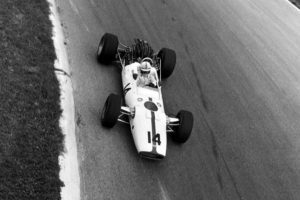 Another victory the year after at the German GP and glory at Monza helped set Surtees on the way to that title showdown in Mexico City in 1964. Racing in the unfamiliar white and blue-striped colours of NART (North American Racing Team), Surtees prevailed after Clark’s Lotus failed and team-mate Lorenzo Bandini allowed him through to the second place he needed to be champion. Surtees would remain at Ferrari until 1966, a year in which a second title beckoned – only for typical Machiavellian Italian politics to scupper his chances. The relationship with team manager Eugenio Dragoni had long been sour. Following a calculated and brilliant wet-weather victory in the Belgian GP at Spa, Surtees lost his temper at Le Mans when Dragoni insisted that Ludovico Scarfiotti – nephew of Fiat’s Gianni Agnelli – should start the race. Surtees would never reveal the details of his ensuing row with Enzo in Maranello – but his time at Ferrari ended there and then. The pair would later vow to remember the “good times” rather than the bad. Surtees jumped to Cooper and with Maserati V12 power he won in Mexico and still ended up second to Jack Brabham in the world title, despite his team switch. 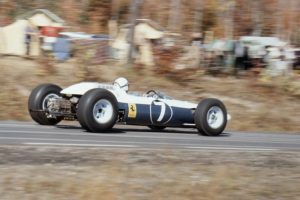 For 1967 he headed to Honda and showed the typical bullish leadership to corral the Japanese manufacturer into using a converted Lola Indycar to breakthrough success. With the so-called ‘Hondola’ he’d claim the Italian GP at his beloved Monza – his last world championship success. An unhappy spell at BRM led him to the decision to head down a new route: that of team entrant and constructor. The Len Terry-designed Surtees TS7 would herald the start of John’s third motor racing career – and one that would be marked overwhelmingly by disappointment. Fellow bike legend and four-wheel convert Mike Hailwood would claim a European F2 title in a Surtees in 1972, but grand prix success would elude the team. Financial problems and rows with sponsors would grind John down through the 1970s and by ’77 he’d had enough – physically and mentally. He disbanded his team officially the following season and sold his FOCA entry to Frank Williams. For years he wanted little to do with car racing. Success in property brought financial security and he found happiness with his second wife Jane, who bore him two daughters and an only son – Henry. Surtees found himself cast as a karting father and a new chapter in motorsport began. Henry showed promise and by 2009 had risen to the ranks of the FIA’s reborn Formula 2 championship – only for tragedy to strike at Brands Hatch. An errant wheel from another car would cruelly end Henry’s life, leaving his family heartbroken. The motorsport world assumed John would never be seen at a circuit again. But incredibly Surtees found the strength to turn his pain into a reason to carry on and return to the world that had given him so much – only to rob him of his precious boy. The Henry Surtees Foundation would become John’s life and the charity would raise thousands for air ambulance services and head injury research. Out of the worst possible tragedy, Surtees found the strength to carry on into his ninth decade – and his incredible energy would make him a familiar and popular figure at Goodwood and classic car events around the UK. In his later years Surtees appeared to come to terms with his place as a cherished hero of motor racing’s golden age and would speak happily and at length about his years on bikes and in cars. The Can-Am success in Lola T70s, the grand prix and sportscar successes at Ferrari, the love affair with Italy… the stories were recalled with a clarity of mind and energy to shame those of half his age. John Surtees, CBE, OBE and MBE, is survived by his wife Jane and his beloved daughters Edwina and Leonora – and bequeaths a colossal legacy to motorsport that will never be forgotten. A three-wheeled Morgan became the pride of a Hebridean island after it rolled onto Berneray in 1933. It was the first ever private motor car on the island and it caused quite a stir after arriving on the deck of a trawler. 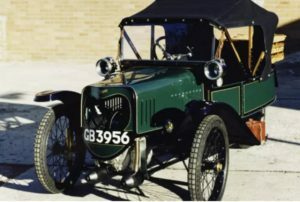 The car belonged to Finlay Paterson, a merchant and JP, who bought the car, a standard Runabout model, in January 1933. It became a popular sight around the islands and at least one bride arrived at church in the Morgan on her wedding day. The car is now a key exhibit at the Lews Castle museum in Stornoway, which was officially launched by First Minister Nicola Sturgeon this week. The Morgan has returned home to the Hebrides after it was restored by an Edinburgh policeman and donated to the National Museums Scotland. Records show the Morgan was first registered in Glasgow in 1923 and bought in Inverness two years later. The first stamp in the log book shows the original owner to be James Donald Scoular, Tigh-na-Hiaradh, Lochmaddy, on North Uist. In 1931, it was sold to James Donald Scoular of Stornoway who then sold the car onto Mr Paterson. The car was kept in a wooden shed in Berneray by Mr Paterson’s daughter Bessie following the death of her father, who was also a JP and a ferryman who brought the first motorised boat to his island. Documents which were handed to Mr Sutherland show the Morgan cost £128 new with acetylene lights (£139 if fitted with electric lights), and the road fund licence was £4. Insurance papers from 1932 show the car was insured for travel only on the Outer Hebrides at £3-7-6. Mr Sutherland donated the car to National Museum of Scotland in March 2000. Moving the car to the Lews Castle Museum was one of the trickiest tasks for museum staff. The museum looks at the long human occupation of the Outer Hebrides with people’s relationships with the land, sea, work and community key themes to the curated space. Through a partnership with the British Museum, six of the world famous Lewis Chessmen take their place as a centrepiece within the main gallery. The playing pieces, carved from walrus tusk and whalebone some 800 years ago, were discovered on Uig beach on the west coast of Lewis in 1830. Over one third of the objects on display have been loaned by National Museums Scotland with including a spectacular Viking hack-silver coin hoard also among exhibits. (‘Noggin’ Definition – A small quantity of alcoholic drink, typically a quarter of a pint. ‘I imagine you all go round to the pub afterwards for a quick noggin and a chat’). Many folks we expected, but some we didn’t. (It was a big Porsche weekend and there were a number of competing Porsche activities.) Interestingly enough, all those with mixed affection (affliction? ), e.g. Porsche and Morgan, came by for the Morgan Noggin. Perhaps Porsche overload, I don’t rightly know?? But, they were very welcome!! Sliders, the chosen watering hole this year, was extremely accommodating. We had a large expanse of tables, almost a complete room to ourselves and a good number of very attentive wait staff. Sometimes with a big crowd you have to be patient as the staff never seems quite prepared. This time, however, they were great! I don’t think I ever had an empty glass. And, the beer was always cold. It was great to see our MOGSouth friends and welcome new ones. Much of the MOGSouth region was represented. We even had a few MOGSouth members come quite far (e.g. Jim and Karen Besst from Ohio) to join us. Some usual attendees were unable to join us due to medical issues and they certainly are in our thoughts! In attendance were Chuck & Karen Bernath (FL), Jim & Karen Besst (OH), Mark & Andrea Braunstein (FL), Austin & Jenny Britton (FL), Robin & Christine Bycroft (FL), Rick & Sam Frazee (FL), Ken & Pat Kreuzer (SC), Peter McManemy (FL), Brian Miller (AL), Skip & Jill Nunnally (AL), Allan & Mary Ann Rae (Canada via FL), Bruce & Delores Reynolds (SC), John & Debbie Stanley (FL), Nancy & Robert Ullerich (SC), Joe & Sharon Topinka (VA & FL) and Ray & Susan Morgan (GA). The Amelia Island Concours d’Elegance is usually on Sunday, with a Cars and Coffee gathering for non-Concours collector cars on Saturday. This Cars and Coffee event is scheduled early and ends early, around 1PM, as the Cars and Coffee uses the same golf course holes (holes 17 & 18) that they use for the Concours. The popularity of the Cars and Coffee event in the past few years has necessitated the creation of an overflow area, in addition to the main show field, called the MotorXPO (golf course hole 2). 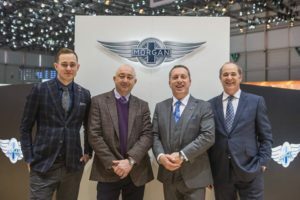 This year all the Morgans were to be located in the MotorXPO. Usually, the organizers want to get the collector cars off the main show field so that the Concours cars can get settled in on Saturday afternoon. Well, it turns out that the Concours d’Elegance organizers, in their wisdom (? ), moved the Concours d’Elegance up a day, to Saturday, due to the expectation of substantial rain on Sunday. This moved all the Cars and Coffee cars from the main show field into the MotorXPO overflow area. The MOGSouth plan for Saturday, 11 March, was to have all the Morgans rendezvous at a location close by and then travel in convoy to the Cars and Coffee location. We have found that if we don’t arrive as a group, we get scattered and parked wherever they have a spot. This year, we all arrived at the Surf restaurant parking lot at 8AM and proceeded, in convoy, for about a mile or so to the Cars and Coffee event. We entered the event and were told to proceed down the middle of the golf hole (golf course hole 2) and we would have spots at the end of the fairway. There were already cars lining both sides of the fairway, all the way down. I guess we were none too early. After a few minutes of idling, however, we were told just to stop in place. They decided were best situated down the middle of the fairway. Apart from the lack of shade, I don’t think we could have gotten a better parking spot! All the spectators had to come by the Morgans as they went up and down to see the other cars. We got lots, and lots of attention. We had about a dozen cars on the field. Cars from the 1960s, 1970s, 1980s, 1990s and 2000s. A great display! Cars in the Morgan ‘conga line’ were those of Chuck & Karen Bernath and their son Rob, Jim & Karen Besst, Mark & Andrea Braunstein, Rick & Sam Frazee, Ken & Pat Kreuzer, Peter McManemy, Brian Miller, Skip & Jill Nunnally, Allan & Mary Ann Rae, Bruce & Delores Reynolds, John & Debbie Stanley, and Nancy & Robert Ullerich. Peter Olsen, Tom Perkins, Tony McLaughlin, Ray Morgan, Stu Mosbey and Austin & Jenny Britton came by to say ‘hi’ and support the club. A great MOGSouth weekend and there is no doubt why it is becoming a recurring event for the club. Undoubtedly we will do it again next year. Plan on it!! Christopher Ward has unveiled three watches created in partnership with Morgan Motor Company. The two British companies first announced they would work together in November last year, promising to unveil new watches not at Baselworld, but at the Geneva Motor Show. The watches draw on the design, engineering and manufacturing skills of both Morgan and Christopher Ward. Christopher Ward’s senior designer Adrian Buchmann worked with Morgan’s head of design, Jonathan Wells on each model, each of which uses a custom-made version of the watch company’s in house Calibre SH21 movement, which is hand-built in its Swiss atelier. The three watches will initially be sold only to Morgan car owners when they go on sale later this year. They will be sold exclusively through authorised Morgan dealerships or at christopherward.co.uk. It is the first time that Christopher Ward has allowed its watches to be sold by a third party. Housed in a Grand Malvern case, the C1 Morgan 3 Wheeler Chronometer offers a number of visible parallels to the Morgan 3 Wheeler motorcar. It has been designed to echo the bygone aviation era that inspired the 1909 original, whilst also referencing the 21st century technology present in its modern iterations. Price is £2,250. This watch, using a modified Grand Malvern case, is sculpted along the same flowing lines of the Morgan Classic and houses a Calibre SH21. It is also priced at £2,250. Top of the range is the Aero 8, which uses a bespoke version of the in-house Calibre sh21 chronometer movement inside a case designed to captures the supercar characteristics of the Aero 8. It will retail for £2,795. 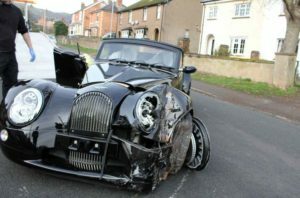 A brand new, handbuilt £85,000 Morgan sports car has been spectacularly written off just a mile from the factory. The swanky motor had been out for a test drive after mechanics noticed it was making strange noises – and ended up parked half way through a garden wall. 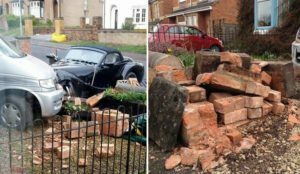 Dramatic pictures show the Aero 8‘s front left wheel arch completely buckled after it ploughed through a brick wall into a parked campervan. Devastated dad-of-one Will Jones, 44, who owns the RV, was hoovering inside his home when he heard a loud bang at around 8.45am yesterday (3/1 Wednesday). He assumed it was the bin men but was gobsmacked when the sheepish Morgan mechanic knocked on his window and showed him the damage to his beloved camper. Will, a graphic designer who lives with wife Tonia, 45, and their daughter Isabella, seven, on Madresfield Road in Malvern, Worcestershire, said: “I couldn’t believe it. “This mechanic came to my window about 10 minutes after I heard the bang to apologise. It is also feared the 4.8-litre V8 roadster – which has a top speed of almost 170mph and can go from 0-60mph in 4.5 seconds – has written off Will’s £18,500 campervan. He added: “We were going on holiday in three weeks’ time in the campervan. We were planning to go to Hadrian’s Wall. My daughter is home educated and it was a history trip. “But I don’t know what we will do now. The insurance people think it’s a write-off. It hammered into the van. “Pieces of stone from the wall were thrown about three metres. It would have gone into our house if the van wasn’t there. Next-door neighbour Janet Jones, 53, said: “I woke up and heard a large bang. I thought it was a postman and jumped out of bed and by the time I got outside the driver was out. Morgan has 170 employees who build just 900 cars by hand per year. Bottom line is that, through a process of elimination, I figured out that the rheostat that measures the air temp behind the radiator had failed. Tried to find a replacement at several local auto parts stores without success. (None even recognized what it was). Then discovered that there is a very small part number (I am talking about getting out the magnifying glass) under the coil on the back side, along with a similarly small Ford logo. Took the part to the local Ford dealer who had never seen one before but checked their inventory and had one. Walla! Apparently it is quite an obscure part. So, if you ever have this problem here is the Ford part number: F5RZ*8L603*AC, described as a “Resistor A”. And be sure to save the pigtail from the old switch as it will have to be soldered to the new one and then sealed. Oh, one last thing. After installing, when I ws running the engine to test the switch I could not get it to turn on. I stood there for 30minutes watching it (watched pot etc.). Finally figured out that because it was measuring air temp I needed to close hood (oops; bonnet) to increase temp. Closed hood and within 60 seconds it turned on. Again, thanks to everyone for all the feedback. Next project, the oil pressure gauge.